Smoked Pure Pork Tasso seasoned to perfection! Teet's Smoked Pork Tasso brings your gumbos and sauces to a new level whenever you cook this Cajun Tasso! Try it in anything you'd like! It is delicious! Contains: pork, salt, red pepper, curing salt. Smoked Pork Tasso has been added successfully to your wishlist. 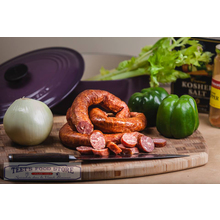 Teet's Smoked Pork Tasso brings your gumbos and sauces to a new level whenever you cook this Cajun Tasso! Beautiful smoked pork tasso that is bursting with great flavor! Smoked Tasso is also known as Tasso ham in other regions. Tasso is boneless pork that is seasoned with salt and red pepper, then smoked for hours until it has that beautiful red color and is packed with great smokey goodness. Packed in 1, 2, and 5 pound packs. 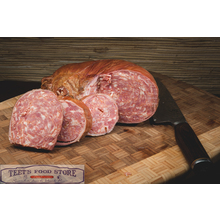 Teet's Smoked Pork Tasso is the best tasso on the market. Contains: pork, salt, red pepper, curing salt. NO MSG! There are currently no reviews for Smoked Pork Tasso, but you can be the first!